When you think of 30 Rock, what comes to mind? Well, it could be the classic, uproarious television comedy that starred Tracy Morgan and Tina Fey. Or, maybe it’s 30 Rockefeller Plaza, where the Rockefeller Center is situated. For this article, however, it is not. What I’m referring to is a recent Poz.com article entitled, “Why Nancy Reagan Refused a Dying Rock Hudson’s Plea.” I decided to write about the post because it’s rather fascinating and telling. 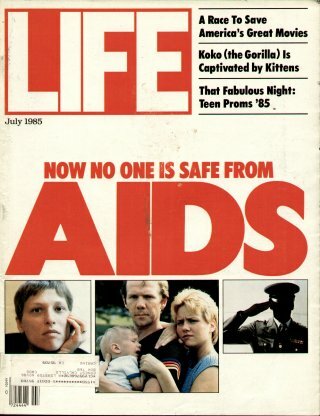 You see, it’s an unvarnished reminder of the feelings and sensibilities Americans had about AIDS in 1985, 30 years ago—when Rock Hudson, the iconic actor, succumbed to the dreaded disease. First though, let’s travel down the “Corridors of Time.” In the mid ‘80s, there was rampant and entrenched ignorance and fear of the illness. People actually believed you could become infected through breathing, and didn’t want to kiss you–even on the cheek. “’It was an awful way to live. They got emaciated. They died a lingering death,’ Bartlett said. ‘If you asked me, ‘How would you least want to die’? I’d say, ‘The way an AIDS patient died in 1990’.” Thankfully however, to a large degree, the advent of antiretroviral drugs began to turn that around. As a result, the infection no longer is a death sentence. Now, on to Rock. He was a mega star of the 1950’s through the ‘70s. And, it was an open secret in Hollywood that this outwardly handsome, macho man was gay. Hudson was “tight” with the Reagans, who were also actors many years before claiming the White House. Weeks before he died of AIDS-related illness on October 2, 1985, Rock asked both the first lady and the White House to help him cut through red tape to see a doctor in France. However, his request was denied. According to Poz.com, “This previously untold detail of an otherwise well-known story was unearthed by the newly restructured Mattachine Society of Washington, D.C., which provided authenticated documents in a BuzzFeed News article. Even with decades gone by, there continue to be strong critics of President Reagan’s response to the AIDS epidemic–or lack thereof. Some of these voices go further, stating that the president had a malign neglect regarding AIDS and harbored hostility towards gays. What we do know for sure is that we’re fortunate that the mindset about HIV/AIDS has evolved for the better. Thank God for that. This entry was posted in blog and tagged Nancy ReaganHIV/AIDS, poz.com, Rock Hundon, Ronald Reagan on March 6, 2015 by Wyatt O'Brian Evans. Yes, thank God, research, treatments, medicine and acceptance has come a long way. Interesting article!!! Thanks, HB–and for your continued support.